The Boycott, Divestment, Sanctions (BDS) campaign at the University of California, Santa Barbara failed Wednesday night when Associated Students senators voted 0-16-7 against a resolution urging UC Regents to divest from companies that do business with Israel. By the end, well into the early morning hours, the legitimacy of several of the resolution’s claims were called into question. With 16 in opposition and seven abstaining, senators decided to vote by roll call – a significant change from the 65th Senate, which voted by secret ballot. Proxy Senator Luvia Solis and Off-Campus Senator Jonathan Lopez attempted to reinstate the secret ballot, arguing that their livelihoods could be endangered, but the Senate ultimately voted to go to a roll call vote in the interest of transparency and accountability, securing a 50 percent + 1 majority. 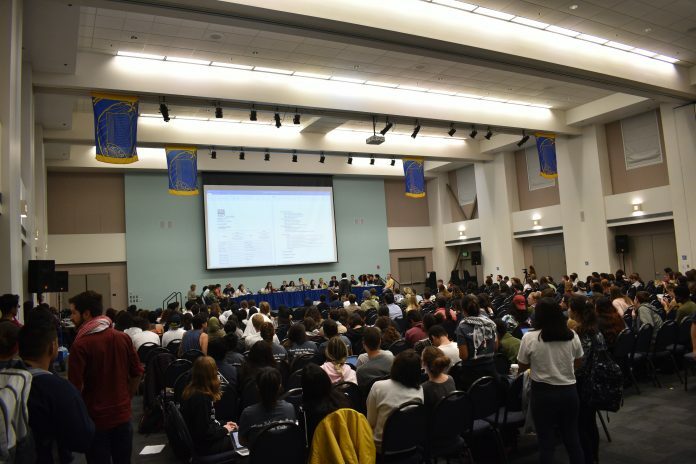 Over 100 students voiced their opinions at public forum, but Off-Campus Senator Izabella Kipnis was the first to suggest that the UC does not hold investments in Raytheon, Caterpillar, Motorola, or any other corporations listed in the resolution. Jordan directed A.S. Executive Director Marisela Marquez to verify the claim. The UC has a collective share value of $13,254,000 in General Electric, according to the list of UC Retirement Plan Holdings. For the better part of an hour, senators struggled to reach a conclusion due to issues of parliamentary procedure. Senators ran through a series of votes to determine how to vote on the resolution, followed by confusion regarding the approval percentage used. With the help of Marquez, Internal Vice President Natalie Jordan established that they had been using a 50 percent plus one approval. Fourth year sociology major Anumita Kaur and third year global studies major Edan Tessema student sponsored the bill. For Kaur, this was the second time she had sponsored a resolution to divest. UCSB professor of communication Walid Afifi, wearing a keffiyeh scarf and a #supportgaza shirt, spoke in support of the resolution alongside over 100 students at public forum prior to the senate’s decision. He cited his own experience as a Palestinian and touched on the risks many students in support of the resolution have taken. “One of the things I wanted to be here for, some of them certainly Palestinian, are very much taking a risk by being here at all because they may not be able to go home,” said Afifi. Afifi and Executive Director of the Santa Barbara Hillel Rabbi Evan Goodman, who also addressed senators at the meeting, teach a seminar together that focuses on exposing and learning from both sides of the dialogue on the Israel/Palestine conflict. Prior to the senate’s decision, tensions ran high. Both sides claimed the other had vandalized their property: a Student Artists for Israel sign spray painted and Students for Justice in Palestine’s wall broken in. Seven Jewish and Israel affiliated student groups together authored a statement of unity against BDS. Student sponsors Kaur and Tessema listed the endorsements of over a dozen student organizations. Jack Alegre, Shomik Mukherjee, and Lauren Marnel Shores contributed reporting. If you look at the resolution, you can see that there are 36 UCSB student organizations that endorsed the divestment resolution, not just “over a dozen”. People in the United Kingdom are tired. They’re tired of hypocrites saying they’re against occupation by occupying their lecture theatres. They’re tired of hypocrites campaigning for rights for Palestinians by depriving Jews of theirs. They’re tired of hypocrites claiming to be in favour of free speech while insisting Zionists be silenced. They’re tired of hypocrites telling them what they can and can’t buy or where they’re allowed to eat by holier than thou activists using Israeli made products to preach their message. Examples of this hypocrisy are everywhere.